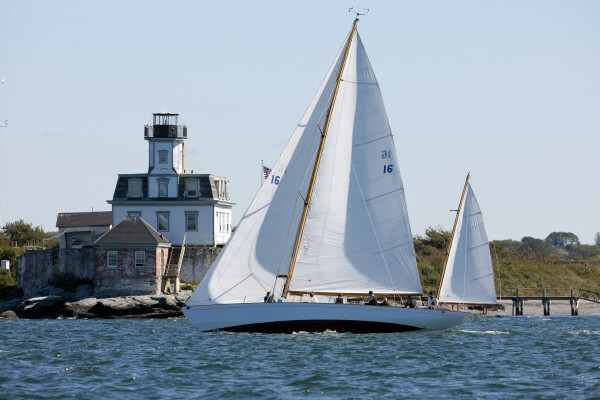 If you’re heading the to Vineyard this weekend for a perfect almost-fall getaway, you’ll be treated to an awesome sight as our beloved customers, Gannon & Benjamin, host the 28th Annual Pat West Gaff Rig and Schooner Race on Saturday, September 16. All Gaff Rig boats and schooners are welcome to enter. The race is held each year in memory of Francis (Pat) West Jr, and benefits the non-profit organization, Sail Martha’s Vineyard. In this 50th edition of the famous ocean race, an early forecast threatened the fleet with nasty wind and waves in the Gulf Stream, but it didn’t stop ‘Comanche’ from setting a new course record. The rest of the racers now battle light air instead of gales, with most only halfway to Bermuda. This sweet video from last week’s A Class Catamaran worlds in Punta Ala, Italy shows just how crazy hairy these fast flying multihulls go… But if you’re showing up at the world championships then it’s implied that you have your “ship” together and are ready to fly. But things didn’t go exactly as planned for the US crowd who sent their boats and equipment over to Italy in advance of the event. When they arrived to unload their container of 7 boats days before the start of the regatta – the cupboard was bare. Actually – the container didn’t make it out of Italian Customs. The prickly customs office refused to release the US container of boats after error in paperwork concerning US custom stamps. Ugh. So in the spirit of sportsmanship and great sailing, a spare boat was assembled with help from other sailors and was offered to Bristol neighbor, Ben Hall, who in turn handed the boat over to high ranked sailor (also neighbor) Lars Guck. Lars had been working on custom low drag boards and rudders that they planned to test at tje event while stacked up against the best sailors out there. The A-Cats are a class that moves ahead of the speed of technology, it seems. Always at the front of a design tweak or development, Lars and others had hoped to launch another innovation to the front of the finish line, but instead he was thankful for a borrowed boat and a 13th place finish, far behind leader and Team NZ skipper, Glen Ashby. There are some lessons here amidst the customs debacle, but the best thing to come of it for the US sailors was the generosity of others who pulled together to make sure the best guy for the course was out there doing his best to reel in the front of the fleet. Don’t count Lars and the other top US sailors out of the front of this fleet just yet! Just keep an eye out at the next regatta for the US sailors to come with trailers and car topped A Cats – leaving the containers and international shipping aside. Because by then I’m sure they will have figured out a way to get the towing vehicle to foil it’s way across the ocean to arrive with their own tricked out boats on time and in one piece. Oy. Back in the spring, we blogged about the crazies from all over the country who met up in the Pacific Northwest to gather together for a fairly typical sailing race start. But everything that took place after that start was pretty atypical. These sailors were not just racing around the buoys or doing an overnight distance race. They were off with their bows pointed – more or less – towards Ketchikan, Alaska. The 750 mile race is divided into 2 stages – almost cut in half. There are squalls, killer whales, tidal currents that run upwards of 20 miles an hour, and some of the most beautiful scenery on god’s green earth. Even if you didn’t care then – care for the first few minutes of this cool video accounting some East Coast sailors who traveled cross country to race their “beach catamaran” in this crazy race. The video is somewhat long – but it’s really well done and the story of this race is so cool. And when it pops up again next spring, you’ll be following the crazies. I know I will.